Employee engagement is a hot topic in the business world and our assessment can help you find out exactly how engaged your workforce is and give you a set of tools that you can use to make any necessary changes. Engagement not only makes a difference in employee satisfaction and productivity, but it can also increase employee loyalty—resulting in less turnover—and positively impact the bottom line. A recent joint study by Dale Carnegie and MSW found that 45% of the workforce is not engaged, and a startling 26% are actively disengaged. Amazingly, that leaves just 29% of American employees engaged at work. How much productivity is your organization losing from these employees? 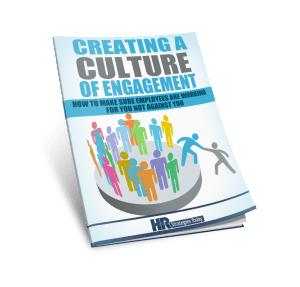 Are your employees engaged in their work? Are they loyal to your business? How do you know these things? And if you don’t, how do you find out? We provide a low cost assessment (<$10)that you can use to find out the level of engagement inside of your company. You can see a sample report here. 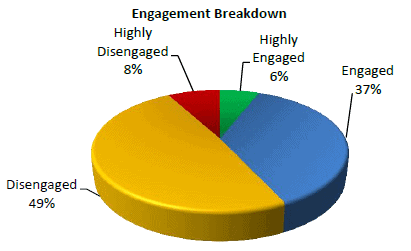 There are many benefits and advantages to understanding engagement levels. Companies with this knowledge have higher retention rates, superior customer service, and realize enhanced bottom-line results. Leaders at all levels of the organization strive to create a work environment that results in highly engaged employees.